I spent the off day in Madison and I was able to watch the Thursday Packer game at a bar with Victoria. I would have preferred to watch it at our apartment but with it being on the NFL network I didn’t really have a choice. I left Madison at 2:55 on Friday afternoon and was parked in the Miller 1 parking lot by 4:30. I walked the parking lots and told people about my mission and Be The Match. I don’t *need* the thank you’s I get for helping spread the message but it definitely makes me feel good about what I’m doing. Thanks to everyone for the support! I ran into a few familiar faces in the general parking lot including a twitter follower that joined me earlier in the year (Eric on 7/2) as well as the younger brother of my friend Jess. I stayed with Alex and Jess in Chicago 12 nights this season. Thanks again you two! 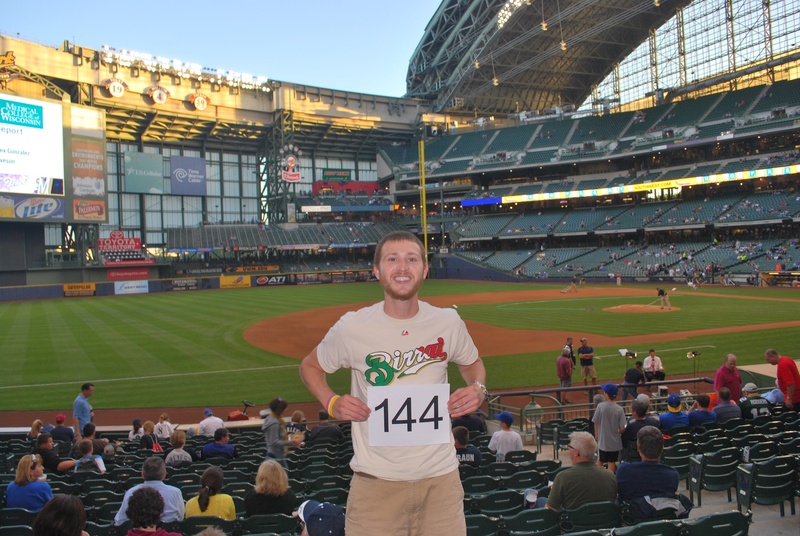 I entered Miller Park at 6:25 on Friday and met my twitter follower (Jay) in section 124 for game photo “gross.” A gross is 144 if you didn’t get the corny joke of mine. After getting the picture taken Jay and I went up to our seats in the loge level. A different twitter follower (Erin) asked if I could stop by for a picture so I went over to section 214 before the game started. 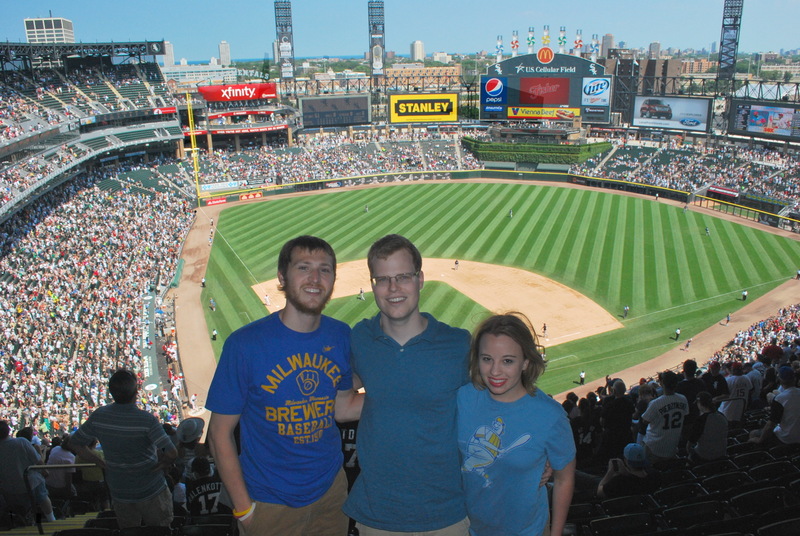 I got a picture taken with Erin and her friend and then returned to my seat in section 221. 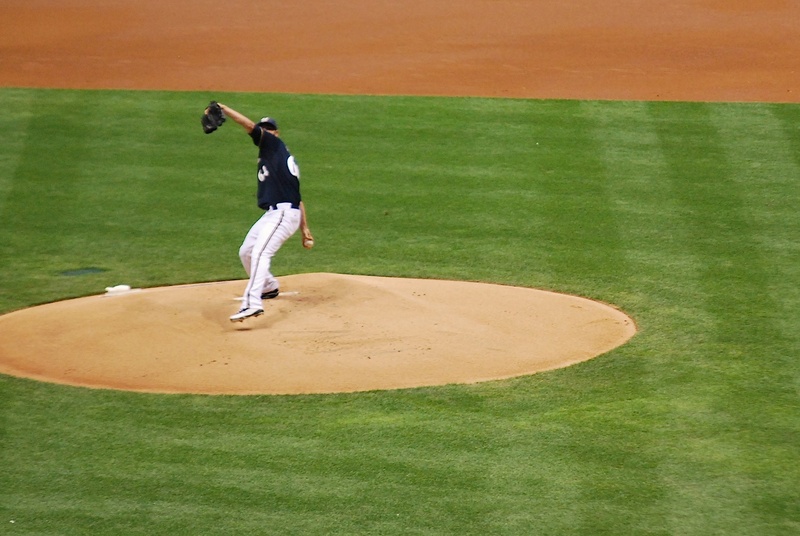 Mike Fiers got the start for the Crew and delivered a ball to Ruben Tejada to open the game. It was a rough first two innings for Fiers; giving up 4 runs on 4 hits and 2 walks while recording six outs. In the bottom of the second the Brewers got back in it when Travis Ishikawa hit a ground-rule double to drive in Lucroy. 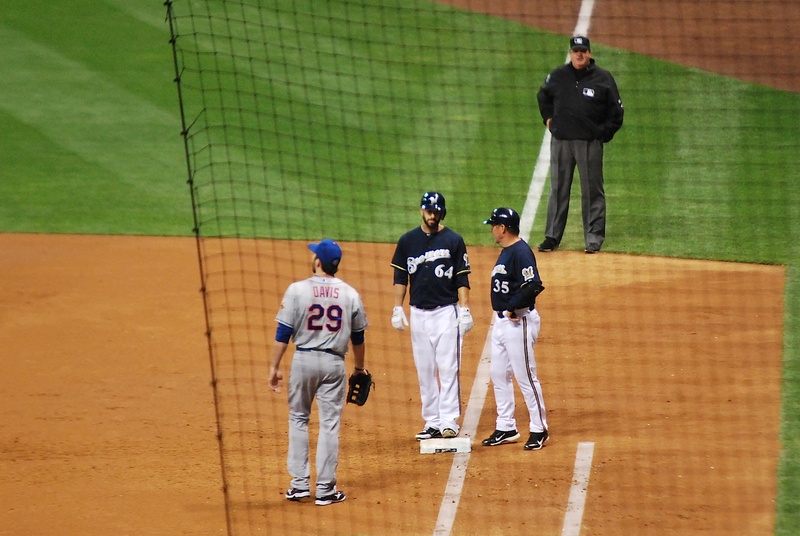 Gomez had been on first and he raced around the bases, touching home and then entering the dugout. That’s when he learned that it was a ground-rule double and had to return to 3rd base. Segura followed Ishikawa and hit a come-backer to the pitcher, who got Gomez in a pickle and David Wright wound up tagging him out. 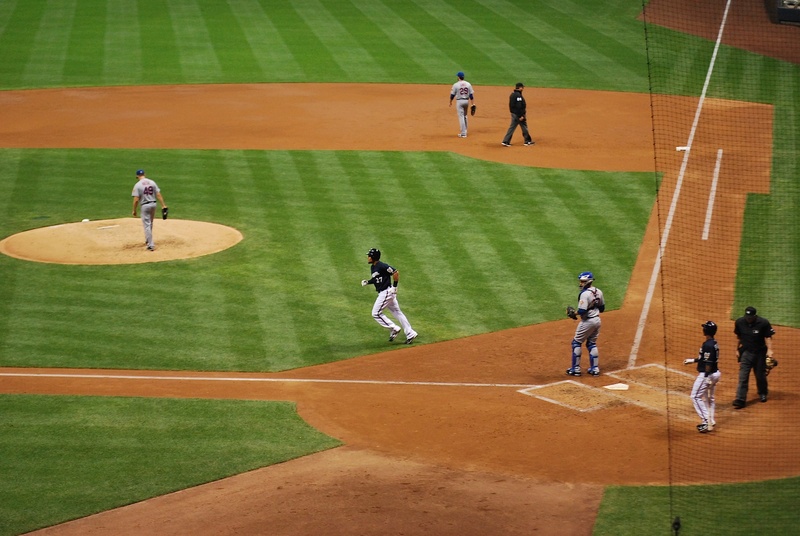 The runners were able to advance to 2nd and 3rd on the play, and there was still only one out. Fiers was up, however, and he’s not the best batter. I was telling Jay that Fiers had been 0-22 with 12 strikeouts before getting his first hit (a bunt). He got the job done on Friday though, singling on an 0-1 pitch, driving in Ishikawa in the process. Atta boy, Mike! Fiers’ RBI-single reduced the Mets lead to 4-2. 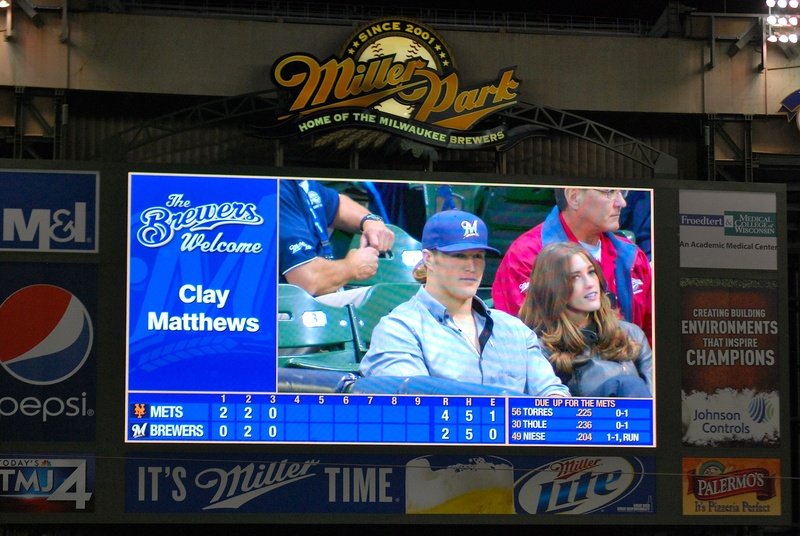 After the 3rd inning they showed Packers linebacker Clay Mathews on the jumbotron. Everyone cheered and it was cool to see him in the stands. I read somewhere that a bunch of Packers were at the game on Friday. Go Pack Go! Fiers was removed for a pinch hitter in the bottom of the fifth and then Parra started the 6th. Parra gave up three runs while only recording one out but two of the runs were unearned due to errors. 7-2 Mets. After the 6th inning I had Kathy, a 20-game pack holder that sits behind me, take a picture of me and Jay. 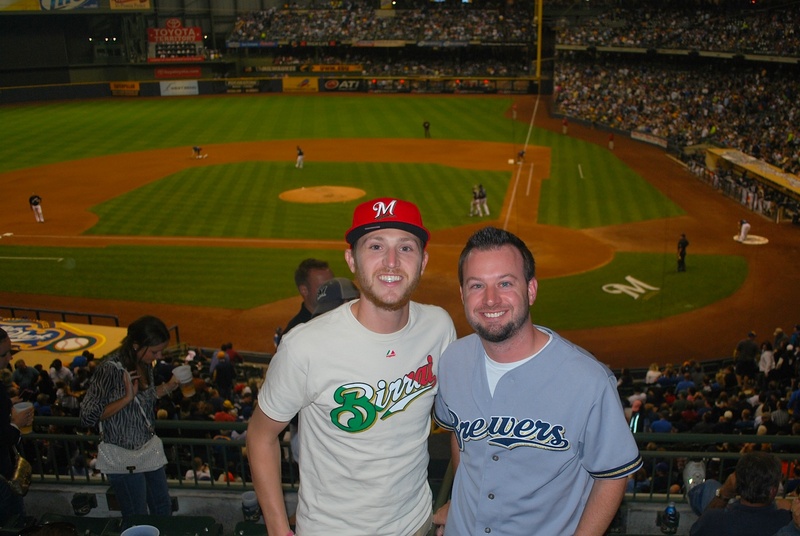 He’s a great guy and he said he’s been to over 400 Brewers games, something that we have in common. He made a $40 donation to Be The Match for his ticket. Thanks Jay! The Brewers scored a run in the bottom of the 9th but that was all they could muster. Final score: Mets 7 – Brewers 3. The loss didn’t hurt as bad as some of the late inning collapses earlier in the year, but it still hurt. Since the Cardinals lost the Brewers could have cut the wild card deficit to just 2.5 games. As is the lead is still 3.5. I stopped at the McDonald’s in Johnson Creek on my way back to my parents’ house. 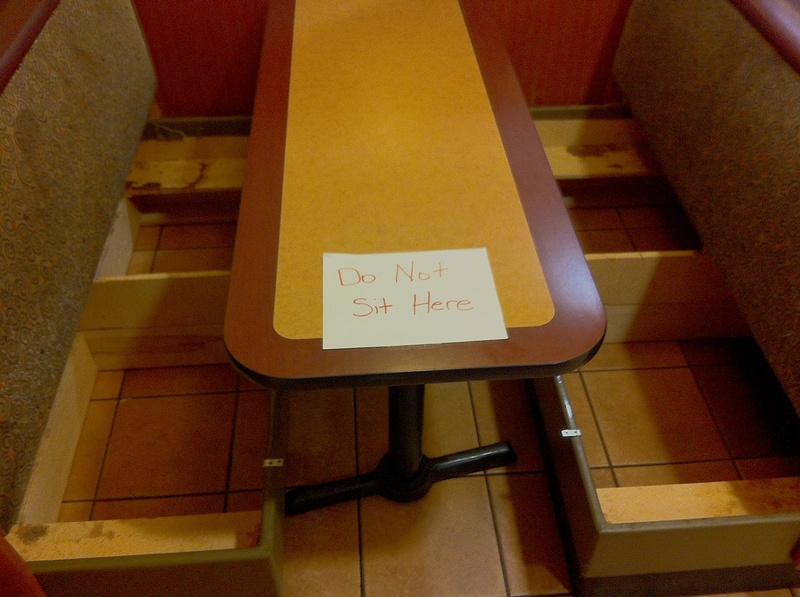 With lawsuits and whatnot I guess this might be necessary…. But really? It’s 1:40 AM on Saturday morning and I’ll be leaving in under 12 hours. I’ll be going to Saturday’s game with Victoria and 17 of her family members. I’ll be sitting in section 407 on Saturday and not my normal seat. I’ll let you know how I feel about this after the game. The sausage count should be a few closer to the century mark after the tailgate on Saturday. I have a new challenge for you. Currently you have 3 pitches left to miss before you reach 100 for the season. I’ll donate $100 for each miss pitch not used under 100 for a total possible donation of $300. This is addition to what Penny and I were planning on doing after the season. Can you do it???? This. Is. AWESOME! Do it!! !